I want to help the science community communicate better. Why me? I’m a design strategist with a background in physics, education, rhetoric and design, and lately I’ve been straddling the interface between the scholars of communication research and the practitioners of science communication itself. My work at this intersection began, formally, as a thesis project during my graduate coursework in design at Carnegie Mellon University, (and informally even earlier— as a physics major who loved explaining physics to non-majors and for several years as a high school teacher). Over time, this work has grown from an exploratory project into an ever-evolving design strategy that I’ve sought to share, (in workshops and presentations) and refine, (through feedback and research), so that scientists and those who communicate on their behalf can be more effective, compelling, entertaining, or persuasive. (Or all of the above, depending on their goals.) My hope is that you’ll read, share, and find some value in the insights I’ve gathered. My goal has been to construct a plan for arranging elements of communication in such a way as to best accomplish a particular purpose. What might that purpose be? That purpose might be to combat climate change deniers, increase vaccination compliance, encourage support for nuclear power, assuage GMO fears, advise policymakers, educate students, or any other unique set of circumstances that a science communication practitioner may find him- or herself in. And that’s just the point. A design strategy is a process, an approach, a philosophy— not a script or an algorithm— one that is grounded in empathy, ideation, and experimentation. This is how “Design Thinking” works (and rhetoric, and science, but that’s a point I’ll be making later). I applied this design process, (sometimes referred to as Human Centered Design), to science communication, synthesizing insights from 18 months’ research, iteration, feedback, and refinement into a strategy that can help science communicators themselves think more like designers. Of course, the individual tactics that serve the execution of a higher strategy are uniquely circumstantial and no proper communication strategy would endeavor to prescribe a specific “way of doing things” as universally applicable. I never intended to develop a series of “How-To”s or prescriptive methodologies, and you won’t find that here. 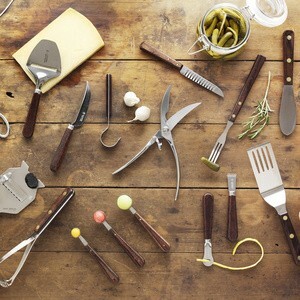 Instead of handing science communicators a specific recipe for communication, the goal of this work is akin to giving aspiring home chefs a little background in food science, handing them a few utensils, and showing them how to use them— and thereby empowering communicators to craft appropriate, but different, recipes for each unique set of circumstances (insert your preferred ingredients metaphor here) with different audiences and messaging goals. In my own discovery process, I’ve found an incredible wealth of knowledge in the field of communication research, or the “science of science communication” as it’s sometimes called. In a perfect world, scientists and science communicators could themselves explore this primary research, but even for those with the inclination to do so, there is rarely the time or the resources available to read stacks and stacks of papers. While I’d certainly encourage anyone interested to explore this primary research, my goal is to help make insights from that knowledge actionable. For those who are interested, Liz Neeley took stock of the current “science of science communication” landscape and explored some of its important questions in a recent blog post, and Kirk Englehardt recently compiled a great list of science communication resources that he shared in two parts. There are also a lot valuable ideas in other fields, ranging from social science to design to education to rhetoric, that give us lenses through which to view and understand science communication and even new tools to better construct it. In Part II, I’ll dive a little deeper into the strategy that came out of my own design process. But before we get there, I’d like to share a brief survey of what I’ve found to be the most relevant research insights. These concepts, theories, and models are the ones I’ve found most helpful and informative— not because they are in any way prescriptive or actionable in and of themselves, but because they helped constitute a solid foundation on which to build a science communication strategy. Every word, image, idea, impression and experience is framed by its context and the medium through which we experience it. Framing is a widely understood concept, especially relevant to the study of rhetoric, but also central to the problem of science communication. 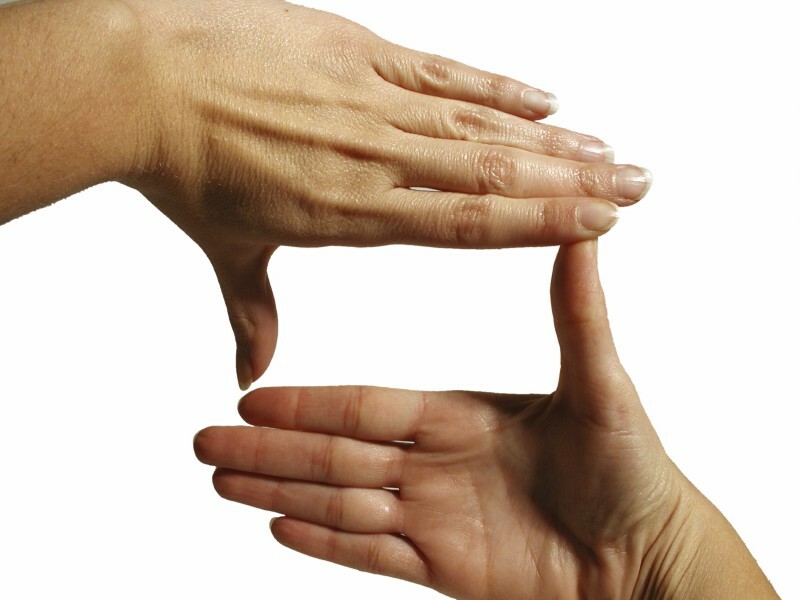 Imagine everyone walking around with two hands up, ‘framing’ their view like an artist assessing his subject matter… and to make matters worse, elbowing their way in front of others’ faces to frame their view as well. I suppose an ideal world would be one where science information isn’t framed at all, where, like the natural world, it’s just there for everyone to take in as some kind of objective reality. Of course, information doesn’t work like that. Some people can’t even see the view without someone pointing where to look; others find it overwhelming or blurry. Framing is important for understanding. What’s more, information itself may be objective (up for philosophical debate, I know), but how it’s framed is quite subjective and significantly affects the way an individual processes that information. Like those hands held up to frame a visual perspective, in some ways they obscure things, perhaps to deceive or just to aid focus. But the effects of framing are often more subtle than just directing people’s attention. Framing the same information with different contexts (or narratives or metaphors or even single words) can make what’s being framed appear very different. As surely as it can be used to fabricate false arguments, exploit emotions, and claim undue authority, the field of rhetoric also offers a window into the more noble application of its art to understanding the audience on a deep level and determining how their needs for logical argument, emotional resonance, and trust inform communication strategies. 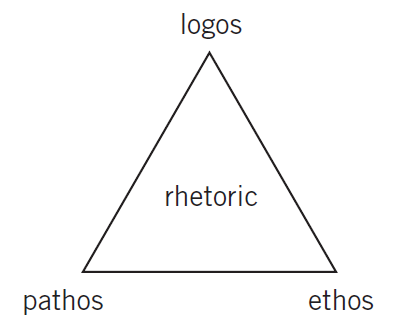 Rhetoric is often said to rest on three pillars: logos, ethos, and pathos. Aristotle defined these pillars as appeals that can be made by a speaker. Logos refers to the internal consistency of the message, the clarity of the claim, the logic of its reasons, and the effectiveness of its supporting evidence. Ethos refers to the credibility of the writer or speaker. Ethos is often conveyed through tone and style. It can also be affected by the writer’s reputation, his expertise, his previous behaviors, and his integrity. Pathos is the use of narrative techniques that help an audience identify with the author’s point of view. The values of the writer are implicit in the message. Pathos refers to both the emotional and the imaginative impact of the message on an audience. A well designed rhetorical strategy balances all three of these appeals, and Jamie Vernon recently made a good case for leveraging rhetoric for improved communication of science. In How Many Rhetorics? Wayne Booth covers the history of rhetoric, in both practice and study, including its ever-changing reputation over history as both the noble art of persuasive communication and the deceptive “art of lying.” He explores the myriads of rival definitions and celebrates several of the writers and thinkers who have embraced (or re-embraced) rhetoric in the modern era. This concept of Listening-Rhetoric is especially relevant for science communication: while many in the science community have tried simply to argue climate change deniers down with logic or consensus messaging, for example, they have been frustrated by the failure of those efforts to persuade audiences who have been taken in by stronger appeals to emotion or authority. Listening to the audience, or in another sense, understanding how they perceive and react to information, can go a long way toward designing a rhetorically powerful approach to science communication. Leah Ceccarelli’s Manufactured Scientific Controversy: Science, Rhetoric, and Public Debate examines three cases of “manufactured” scientific controversy, and offers a comparative study of argumentative dynamics to reveal what she deems “rhetorical traps” set by those who seek to delay policy decisions by questioning scientific consensus. Unlike many others writing about the rhetoric of science, I appreciate that Ceccarelli makes a clear and concrete recommendation: to shift the rhetoric of science from one of scientific discourse among researchers to one of a public facing rhetorical approach to science communication. Meanwhile, through a similar case study of the nuclear era and associated controversies over the last several decades, Carolyn Miller explores the role of ethos in risk analysis, describing how scientists are expected to support a claim with factual observations and sound reasoning (logos), suppressing appeals to emotion (pathos) or personal character (ethos). Miller’s arguments shed light on the challenges faced by the science community (some by their own creation, of course), in constructing and maintaining credible ethos without subverting it to logos. In designing communication strategies that can appeal to the public and counter misinformation, it becomes especially important to avoid the pitfall of over-reliance on any one of the three appeals to ethos, logos, or pathos. Craig Waddell wrote (way back in 1990!) that scientists possess an important responsibility in this process via two functions: lobbying and informing. More recently, the role of scientists and expert communities in policy have been explored by Roger Pielke Jr in. The Honest Broker: Making Sense of Science in Policy and Politics, and Matthew Nisbet’s excellent essay on the subject. If science communicators are to construct meaning for their audiences, they will need to do so deliberately. While information itself may be objective, the language choices made by those communicating that information can frame it in such a way that an audience interpretation becomes quite subjective, and the construction of rhetorical appeals can significantly affect the way individuals process that information. So maybe you’re convinced you should more carefully frame your communication and make stronger appeals to ethos and pathos. Both of these implications require a deeper understanding of your audience. The following models and theories offer insights into how people— both as individuals and as communities— perceive information and develop attitudes. While the following list is by no means comprehensive, the following resources highlight some of the more relevant communication research insights and each informed my process along the way— and may inform yours as well. The Cultural Cognition Project is a group of scholars interested in studying how cultural values shape public risk perceptions and related policy beliefs. Cultural cognition refers to the tendency of individuals to conform their beliefs about disputed matters of fact (e.g., whether global warming is a serious threat; whether the death penalty deters murder; whether gun control makes society more safe or less) to values that define their cultural identities. Project members use the methods of various disciplines — including social psychology, anthropology, communications, and political science — to chart the impact of this phenomenon and to identify the mechanisms through which it operates. The Project also has an explicit normative objective: to identify processes of democratic decision making by which society can resolve culturally grounded differences in belief in a manner that is both congenial to persons of diverse cultural outlooks and consistent with sound public policy-making. In 2008, The Yale Project on Climate Change Communication and the George Mason University Center for Climate Change Communication used nationally representative survey data on global warming beliefs to identify six distinct groups of Americans – “Global Warming’s Six Americas.” Since then, they have tracked the size of these six audiences — and the ongoing evolution of their beliefs, behaviors and policy preferences — through a series of national surveys. Change is hard. Whether its a threat to physical environments or mental states, people tend to fear loss and avoid threatening situations and attitudes. This article hits some of the high points on why change is so threatening, and this study demonstrates how even watching a scary movie can entrench us deeper in our beliefs. One implication worth taking from social scientists’ current understanding of fear and persuasion is that people are far more likely to consider other points of view when they feel relaxed and self-affirmed. 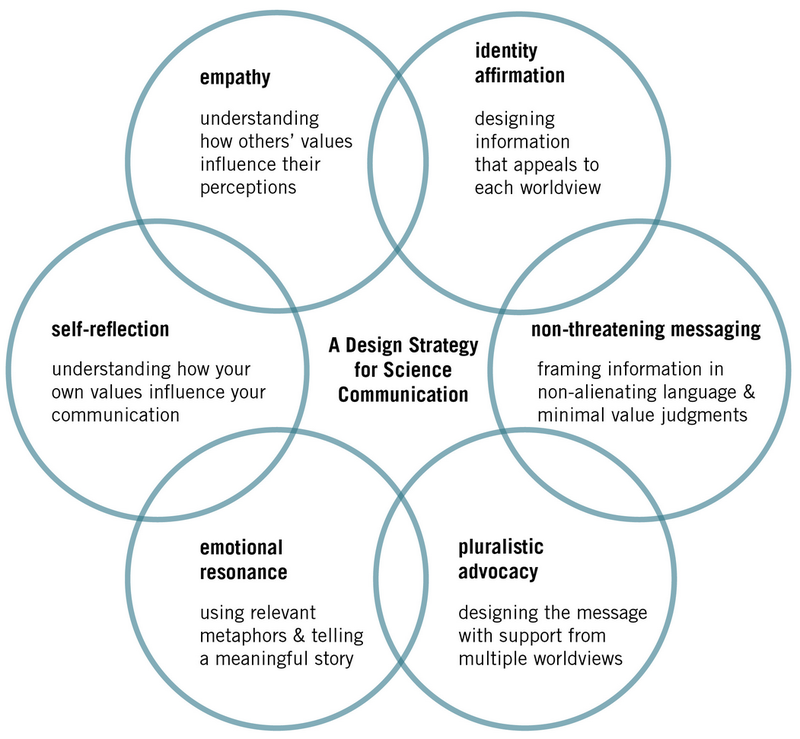 From the preceding concepts, theories, and models, the following six facets crystallized into a design strategy for science communication— one that is both widely applicable and yet actionable for many types of practitioners. In Part II, I dive deeper into each of these six facets and what they look like in actual practice.